Sometimes with a Crown [Gold the most common] and Lettering alone, and sometimes more ornate with Lilies and either Ferns or Ivy or both. In modern times the B and V letters, for Blessed Virgin, are often omitted because of the preference for minimalism. The Lily, symbol of virginity and purity. There is also a white day lily which only blooms during the time of the Assumption in mid-August and is known as the Assumption Lily among horticulturalists. The species here is very similar to the Assumption flower. The mystic rose, symbolizes Mary's mystical participation in the Holy Trinity as Heaven's Rose or Mystical Rose. The Rose you are viewing is a picture of an actual rose called Mystic Rose, developed in her honor. In medieval times the mystic rose symbol was drawn with four petals on a stain glass background or on a multi-colored background like a popular quilt pattern which is still stitched today. The iris or "Sword Lily" is an emblem of Our Lady's Seven Sorrows; see also the Fleur de Lis below. The pear, rarely used except in paintings of the Renaissance and Baroque periods, symbolizes the fruit of her womb. We often combine the Pear with other fruits and flowers when embellishing an image of Our Lady. The Almond is a symbol of Divine favor, taken from Numbers, Chapter 18, verses 1-8, prefiguring Our Lady. The Periwinkle or "Virgin Flower", is an emblem of the Blessed Virgin. Blue is also associated very closely with Mary as one of her colors, traditionally her main garment being colored blue. The Periwinkle blossoms above are pink and white, a variation of the more familiar blue. Some species of the plant bear flowers with more pointed petals so that the shape resembles a star for Mary, Star of the Sea. 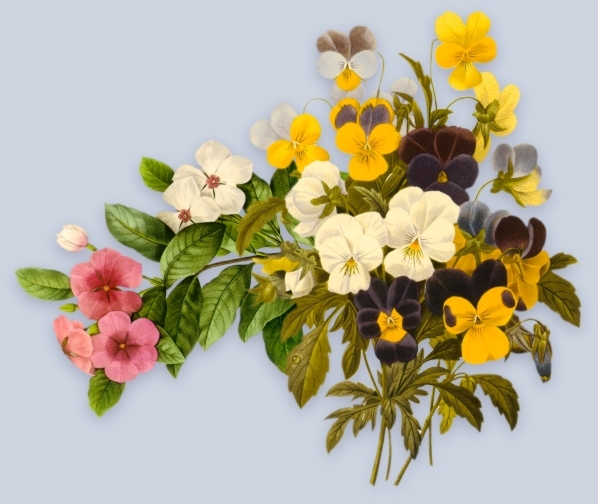 The Pansy is called the "Trinity Flower", because its three-petaled shape, like the Irish shamrock, represents the the Trinity, first revealed to Mary. 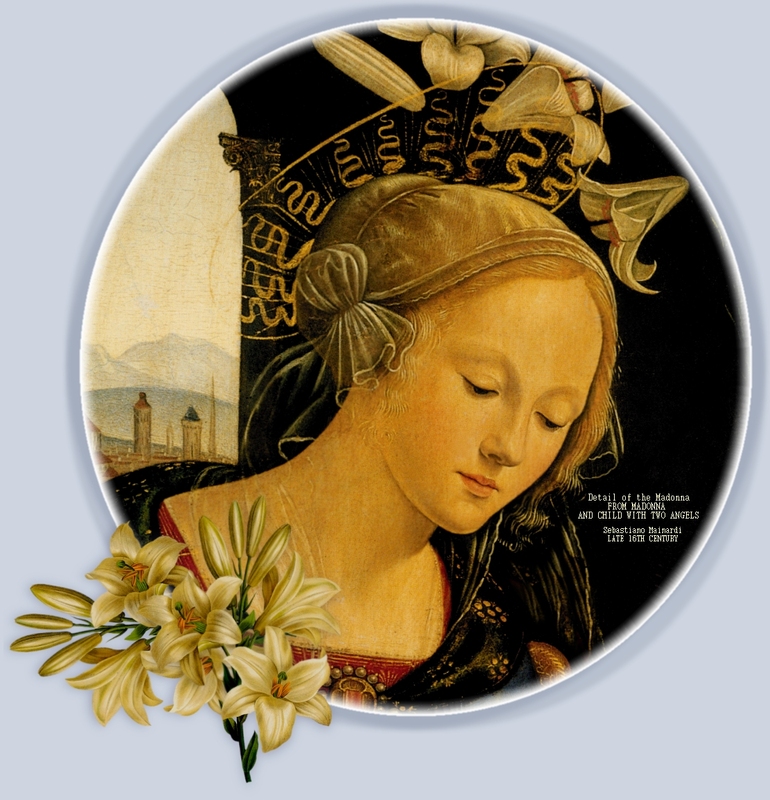 The Fleur-de-lys is a symbol of the Blessed Virgin Mary because it resembles both the Iris and the Madonna Lily. The Fleur-de-lys to the right is the more ornate form, and also symbolizes the Lady's Slipper flower [page 2].